Since Rebecca arrived, we have been busy experiencing travel and I have to apologize for falling behind in my blog. Now, you may find that the posts may be a bit out of chronological order, but I am going to try to write about all of our travels together. Two weeks ago we experienced a long-awaited highlight of our trip: a trek to Choquequirao high in the Andean jungle, and I am anxious to tell you about our adventure there. Almost everyone I have met—at home and here in Peru—has asked me if I would be visiting Machu Picchu. My answer has always been, “No! Way too many tourists! Way too expensive!” Now I will admit that Machu Picchu is probably worth a visit, and I may go there if I ever come back to Peru, but I had already decided not to visit the famous ruins before I left home and before I learned about another set of Incan ruins at Choquequirao. Choquequirao is considered to be a sister-site to Machu Picchu, but few people know about it. Only about 30% of the ruins have been uncovered from the jungle and some researchers believe the site may be even larger than Machu Picchu. A very difficult 4-day trek in and out is required to visit these remote ruins. 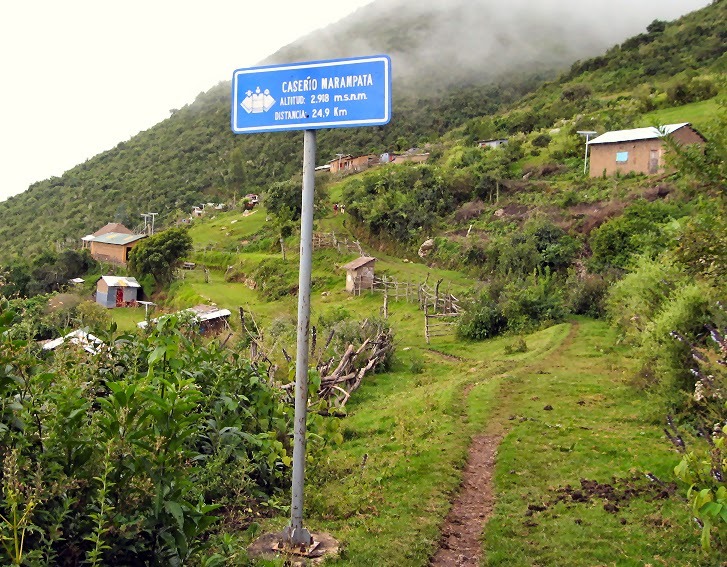 However, the government of Peru is planning to construct a tram to Choquequirao to be operational by 2015. This will cut the 4-day trek down to 15 minutes for tourists. The government is hoping to relieve the tourism stress from Machu Picchu. So this may be the last year that a mob-free trip to Choquequirao may be possible. Our original plan was to make the trek in 5 days—two days in, a day to visit the site and rest a bit, and 2 days out, but at the last minute two other people were able to join us (making it cost a bit less for us), but only if we could do the hike in 4 days. After a bit of discussion, Rebecca and I decided to go for a 4-day trek with the help of a hired horse for insurance in case the going got too tough for me. 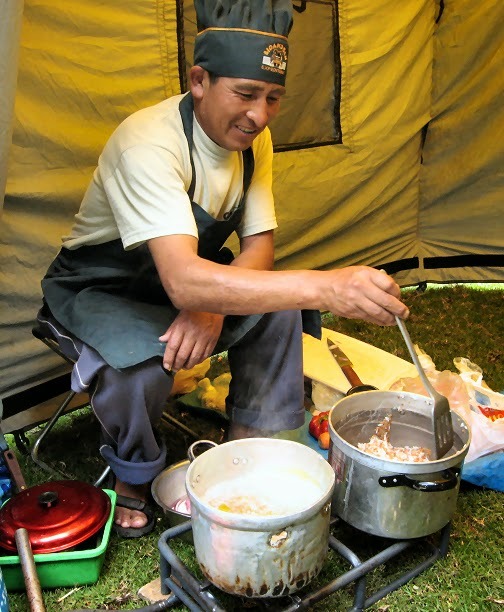 We hired BioAndean Expeditions, an outfitter with an English-speaking tour guide, incredible cook, and horsemen and their pack horses to carry all the gear for us. As you will see, this was luxury camping at its best! We began our expedition on Tuesday (April 22) when the van and our guide, Samm, picked us up at our Cusco hostel at 4:30 in the morning to make the four-hour journey to the trailhead near the village of Cachora. 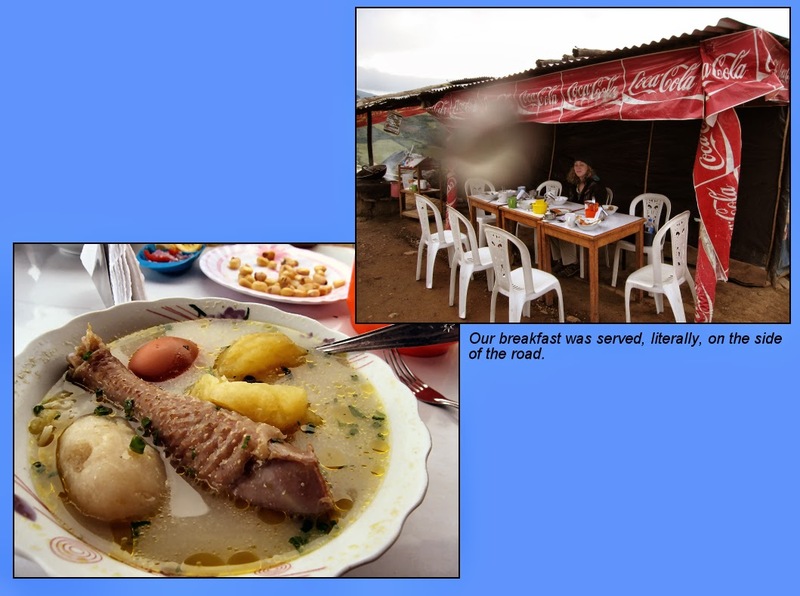 On the way, we stopped to eat a traditional Peruvian breakfast of sopa de gallina (stewing hen soup) with potatoes, chuños (naturally freeze-dried potatoes), a piece of chicken, and a hard boiled egg complete with shell. As we were preparing to set out at the trailhead, we met Nat. Since it was obvious he was from the States, we exchanged our “Where are you from?” inquiries and it turned out that Nat was from Portland, Oregon. When we told him we were from Vashon, he asked, “Do you know Bill Moyer?” We just laughed incredulously! Bill is a long-time good friend of ours! south side of the canyon. 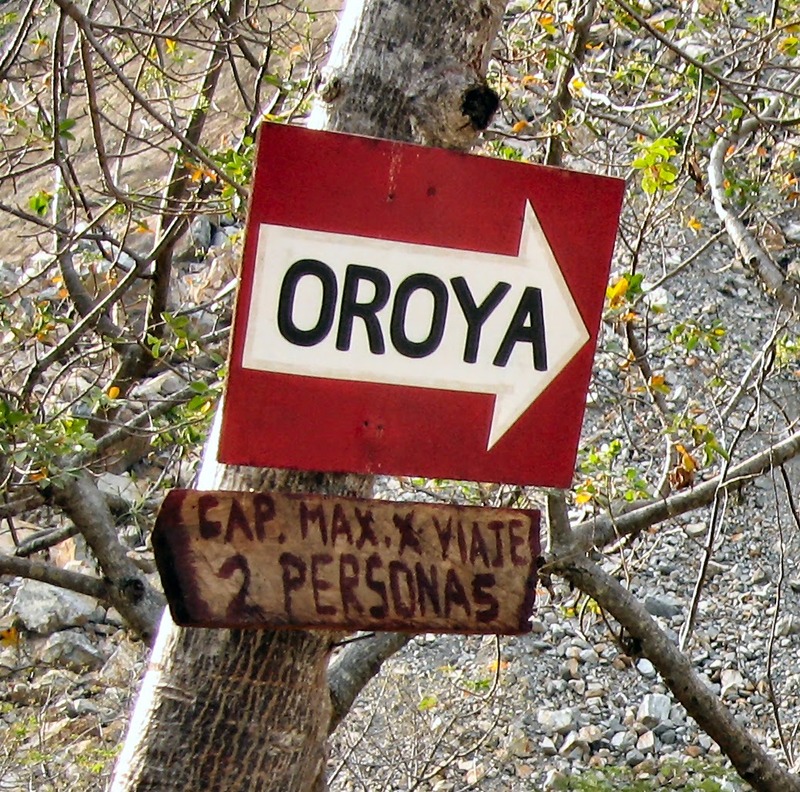 The pack horses and horsemen met us at the trailhead and by 11:00 am we were off—mostly downhill—for 10 kilometers to go from 9,850 to 4,850 feet above sea level to our first camp at Playa Rosalinda right next to the raging Apurímac River. Ever (pronounced eber) was the very patient horseman leading our “insurance” horse on the first and last day. I was, by far, the slowest of the four trekkers, but throughout the trip, Ever stayed behind or beside me, just in case I needed to ride. He was so sweet and, although he is fluent in Quechua and Spanish, he did not speak any English, so we carried on fun conversations about how I needed to be careful and take care of my knees, whether I was married or had a boyfriend, whether he was married or had children, how long I had been in Peru, how incredibly beautiful the canyon is, etc. Santiago prepares one of many delicious meals! Our guide was Samm, an incredibly gifted young man of only 23 years, who could not have made our trip more wonderful. The crew of horsemen and a cook carried all our gear on horseback for us. All we had to carry was some water, camera, rain gear (just in case), sunscreen, and our snacks. When it was time for lunch, Santiago, our cook, had a full hot meal ready for us, including soup and a three-dish entree. Then when we arrived at camp in the evening, our tents were set up, complete with comfortable Thermarest mattresses. We could rest a bit before dinner was ready, which, again was a full meal, beginning with tea and popcorn and crackers or mini-cheese empanadas, followed by another delicious soup, a three-dish entree, and dessert. If we did not get enough to eat on this trip, it was certainly our own fault! Now the miracle of all this food was that Santiago prepared everything from scratch (to feed us and the crew!) on a little cutting board and a two-burner stove. The horsemen assisted him, and everything came to the table piping hot and fresh. Amazing! Santiago’s mushroom soup is the best mushroom soup I have ever had. Samm, our guide. Lower right: the cable car we rode across the river. The Apurímac River lulled us to a very restful sleep. I was so tired that I barely moved all night. We were awakened at 4:30 am by a polite “Buenos dias” at the tent door from Santiago, who brought muña (a kind of mint) tea and washing water. What great room service! We had to get going early to beat the heat as we walked up, up, up the other side of the canyon. But first! We were treated to a lovely breakfast of omlettes, fruit, and bread to fill our tanks! We only had to pack up our personal gear. The tents were taken down for us—Ahhh, luxury camping! Our first order of business on the second day was to cross the Apurímac River. Last year, the bridge was washed out and an oroya (cable car) has been set up. I was a little nervous at first, not sure if I would be afraid, but it was great fun. The car “falls” half way across the river and then Samm on the other side pulled us the rest of the way over. I was only sorry that the trip across was so short! Now we would hike up from the river at 4,850 feet above sea level to our campsite at 9,950 feet. It was pretty difficult for this 60-year-old. I was glad that I was fairly well acclimated to the altitude. I decided that I take advantage of our extra horse to help me up part way for about an hour and a half. This would, hopefully, keep me from encountering overuse injuries that would make it difficult to finish the trip. 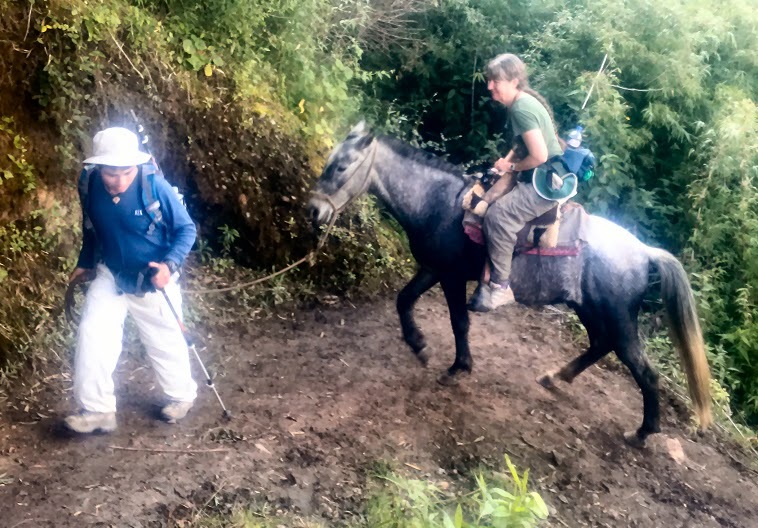 Samm led the strong little Peruvian pack horse up the trail. These horses are not trained to use reins—only to be led. It was a good break. We went from arid desert to high Andean jungle in a few hours and the vegetation changed rapidly. About half-way up, we encountered tiny mosquitoes. I was a bit cocky about the fact that mosquitoes do not like me. In the past I have found that they mostly do not bite me at all, and I told everyone so. I really hardly ever saw mosquitoes around me on the trek. That evening, my fellow trekkers and guide were insisting that I had bites all over the backs of my arms and on my neck. I was still in denial since I could not see or feel them. HOWEVER, I was later to discover that these Andean mosquitoes are very sneaky! I did not feel them bite, did not see them, and they did not start itching much UNTIL I GOT HOME THREE DAYS LATER!! And THEN they made me miserable for about a week. My arms each had about 100 bites on the soft undersides where I could not see them. I felt like a kid with chickenpox! That’ll teach me to brag about how mosquitoes think I have “vinegre, no sangre” (vinegar, not blood). We came to Marampata, Samm’s home village where his mother and sister live. This was a nice rest stop where we purchased apples, drinkable yogurt, and some milk chocolate from a tiny store. The only way in and out of this village is the way we had come—down to the Apurímac and back up via the steep trail, so it seemed so funny to find the store here. The chocolate came in very handy later in the day when my energy really began to flag.